Hiya! This is the first blog post of the 2018 for me and its a beautiful one. I’m going to try and keep on top of all my website and blogging and things, New Year, New Me and all that. I think the whole bridal party looked so cool, when I seen the groom and groomsmen’s suits I was just like “Oh Yessss”, they honestly had an amazing day and everything just looked so stunning. Pams dress was amazing as you’ll see in the pictures, and was created from Pam’s own ideas! A short while ago, we had a dream; a dream of a fantastamagorical place where all that is uncool about the traditional country house can be left behind and replaced by all that is fun and imaginative. Specialising in unique weddings, Newton Hall is a luxury hotel at the heart of Northumberland’s spectacular coastline, and that rare thing – a place of fun and fantasy, love and laughter. Pam and Andrew, who shall be henceforth known as Pamdrew, chose Newton Hall as they wanted to be married near the Northumberland coast, as they absolutely love it, and Andrew also proposed on Embleton Beach. 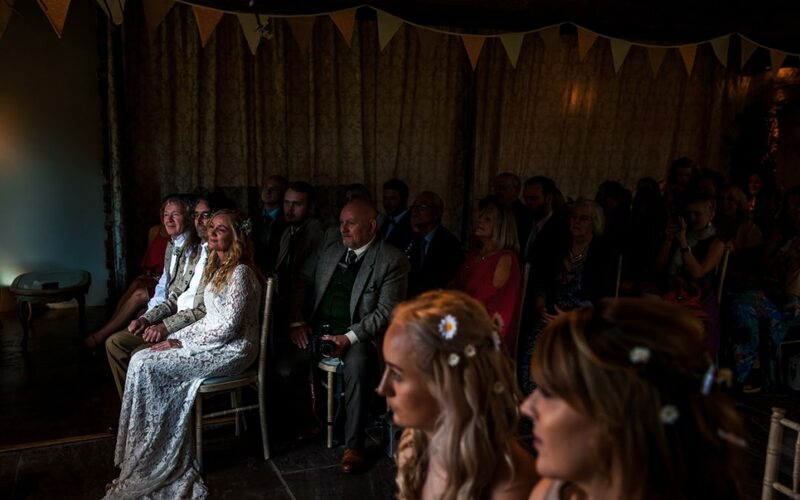 As soon as they saw Newton Hall they fell in love with it and no other venue came close. They also got the whole hotel to themselves on their day, and it meant everything from bridal prep to reception was under one roof. Pamdrew wanted a Beachy/Rustic/Woodland type wedding, and they wanted to be able to use all of the outdoor space, which is exactly what they done. They also used that stunning beach for some lovely pictures. “It’s so difficult to pick one favourite part of the day as it was all so amazing but highlights had to include the ceremony itself & going to the beach just the two of us with Daz for those special surprise photos, which nobody was aware of. Daz was lovely and relaxed and not at all intrusive. He has a great eye for capturing those special moments and details and is really easy to be around. Dress – //www.ohhsewbeautiful.com Amazing! They took Pams ideas and worked absolute magic to create such a stunning wedding dress. Flowers – Wild Flower Florist Jen (info@floralgift.co.uk) was totally amazing, listened to everything we told her we loved, asked us loads of questions & kept us up to date every inch of the way. Her natural, home-grown bouquets, displays, cake flowers & additional little touches were just beautiful and so special & personal. Cake – The lady who made our cake (cakesbytammylouise@yahoo.com) was equally attentive & produced our perfect, most mouth-wateringly gorgeous three tier semi-naked sponge wedding cake with three different delicious flavours & even a gluten-free layer as requested. She also turned up with flourishes of forrest fruits to accompany the flowers around the cake. We were fortunate enough not to need musicians as so many of our friends & family are musicians & offered to entertain us in the evening which made it so much more personal. We then played our pre-programmed ipod through the venue’s system for dance music rather than a DJ which saved money & also made it more personal. I hope you love these pictures!